Pony Canyon streamed the first Attack on Titan Season 3 Cour 2 trailer. The anime reportedly went on hiatus just before the start of a much-awaited arc. The anime will return in Spring 2019. The 90- second trailer features the new opening theme which will be performed by Linked Horizon. The trailer teases a major fight between Reiner and Eren along with Beast Titan on another side. The anime is due to start to broadcasting in April 2019. No exact release date has been announced yet but considering the old timeslot of Sunday, the anime might start broadcasting from 7th April. There is peace again within the Walls, and the Survey Corps prepare for a new expedition to Shiganshina. 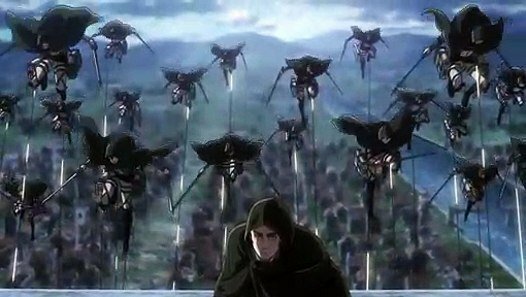 Thanks to Hange’s new weapon, the hopes to retake the lost territory once and for all are stronger than ever. But at their old home, known and powerful enemies are awaiting and a fierce battle is coming. During the “Attack on Titan Event”, it was revealed that Linked Horizon will be back for the opening theme. Linked Horizon previously have performed opening theme for first, the second season and ending theme for the third season. Also, the cinema staff will perform the ending theme. Attack on Titan is a popular manga written and illustrated by Hajame Isayama published in Monthly Shounen Jump. The source material has been adapted in 3 anime series, 8 OVAs, 3 compilation movies, and 2 live actions. The story takes in a world where the last remnants of humanity live within a walled city in order to escape the danger of the Titans, a race of giants monsters that eat humans. The lead character, Eren Yeager, ends up joining the military with his two childhood friends Mikasa and Armin after the Titans break through the wall and attack his hometown. Now Eren, Mikasa, and Armin must survive in a world where they not only have the Titans to fear but the very humans they are trying to save. Thanks for reading, please make sure you all subscribe to our notifications for more latest updates.